UPDATE: The ladies at Polka got back to me about purchasing your own TattooFurniture. Each piece is a one-off and is produced on demand. Prices vary based on which piece of Polka’s furniture you want tattooed, but to give you an idea, the bench shown above costs 3000 Euro. If you have a special tattoo in mind, you can email them your design, so that they can discuss it with Gert. Contact Polka for more details. I must confess that recently I’ve gotten into watching L.A. Ink. I most likely will never get a tattoo myself, but I certainly appreciate the artistry that goes in to designing and making a great tattoo. 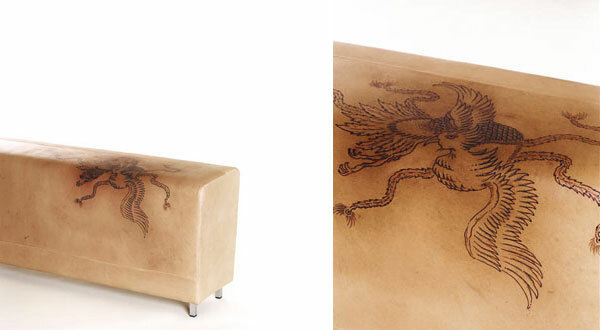 Design duo Marie Rahm and Monica Singer of Polka teamed up with tattoo artist Gert Kowarzik to make a series of tattooed leather furniture. For someone commitment-phobic like me (I’m speaking about tattoos here, not my newly-wedded husband), the tattooed furniture series hits the spot. I love the texture of the tattoo on the leather, and the dark smudges that are traces of the intense areas of work by Gert. Gert in process (above), and a quieter piece below. I’m a tattoo artist. Have been for over 20 years. Was also wondering how you prep. the leather to keep it from blotching and soaking into the leather beyond the stencil area? I’ve tried it on a couple different leather types and can’t keep from making more of a mess then I would like. I would appreciate your help for I love the effect. Also love your work. I am curious to hear how you condition the leather before tattooing and what types of leather you are limited to, as well… I would think the inkwork and lines would get fuzzy on dry leather, not to mention wiping the excess ink away would stain the leather, but your details are precise and clean! Beautiful work! Thank you for sharing, hope to hear from you soon! I have been looking at your great furniture, how do I go about buying something ? Please tell me how do you prepare the leather before tattooing it ? Do you use any type of oil on the leather ? Can you tattoo on any type of leather or are you limited to a certain leather. I liked it a lot… until someone told me that it looks like human flesh. Now I can’t stop looking at it that way. unforunately, this is creepily like the lamp shade made by nazi’s at the death camps. The links have been fixed, and I emailed the ladies of Polka Products to see if any pieces are available for sale. I suspect they are unique commissions. I’ll update when I know. That’s what I was wondering too, since the links in this article are broken. But I don’t know if they’re for sale there. Is there a website to buy these pieces?